+ ARRL Field Day: Have a Frolicking, Rollicking Time in the "Playground"
Part 97 -- the portion of the FCC rules that covers the Amateur Service -- states in Section 97.1 that one of the goals of our Service is "the continuation and extension of the amateur's unique ability to enhance international goodwill." But according to ARRL Field Day Manager Dan Henderson, N1ND, we are more than casual observers or bystanders on this global stage: "We are participants in that magical playground. And I am proud to say that I'm a ham -- my playground is the world!" This year, ARRL Field Day is June 26-27. Henderson explains that even though at times the focus of the Amateur Radio community is rightfully on how we can work with our towns and communities by providing public service and emergency communications, "Deep down anyone who has picked up a microphone, tapped out a call sign on a brass key or descrambled a digital Baudot or PSK-31 signal understands there is fun here. That fun knows no borders. The thrill of the chase of adding new states, countries or grid squares to our Worked All States, DXCC and VUCC totals underscores that when we 'play radio' -- as some friends of mine used to say -- we are there in large part to enjoy our hobby." This is just one of the messages you can find in ARRL Field Day. Each year tens of thousands of participants bring an element of fun with them as they combine the public service aspects of the Amateur Service with the experimental nature our hobby. As they build relationships with served agencies and local officials at Field Day sites across the US and Canada -- and beyond -- they learn new skills as they make or renew friendships both on and off the air. Henderson advises that as you prepare for what many consider the best "total Amateur Radio" experience of the year, "keep in mind the old adage -- 'All work and no play makes Jack a dull boy.' Let your 'inner child' out as you embrace ARRL Field Day 2010. Do something new this year: Build a different antenna, try one of the newer digital modes, operate on a band that you rarely utilize, serve as a get-on-the-air coach for your club, show some neighbors what this 'radio thing' is all about, organize a Scout or youth group visit to your club's set-up -- you are only limited by the borders of your mind. But then again, is there a limit? After all -- our playground is the world!" Stations active during ARRL Field Day -- June 26-27 -- are eligible to receive 100 bonus points for copying the special Field Day bulletin transmitted by W1AW (or K6KPH on the West Coast) according to the schedule below. You must include an accurate copy of the message in your Field Day submission. The Field Day bulletin must be copied via Amateur Radio; it will not be included in Internet bulletins sent out from Headquarters and will not be posted to Internet BBS sites. Read more here. The ARRL Annual Report for 2009 -- now available online and in print -- reviews the major events of the year and documents the renewed growth of both the ARRL and the activities of the Amateur Radio Service. In 2009, the ARRL experienced a growth in membership, ending the year with 156,125 members, an increase of nearly 1 percent from 2008. ARRL President Joel Harrison, W5ZN, called it "obvious, contrary to the soap box of the doom and gloom crowd" that interest in Amateur Radio is still in great shape: "2009 was a year where we exceeded our goal of 30,000 new Amateur Radio licensees and the ARRL membership grew right at 1500 members. Even in a year of national economic turmoil, our publication and advertising sales were strong for the year and provided a solid financial result that will allow us to continue to fund a number of initiatives that support and defend the Amateur Radio Service." Read more here. The July/August issue of NCJ, The National Contest Journal, is filled with the latest news from the contesting world. Whether you are new to contesting or are a seasoned pro -- or somewhere in the middle -- you will find something in NCJ just for you. In addition to the contest-related articles, the results from the January North American Sprint (CW) and the February North American Sprint (SSB) are in the July/August issue of NCJ, as well as the results from January's CW and SSB North American QSO Parties and February's RTTY North American QSO Party. Of course, there are all the regular columns and features you expect from NCJ: "Workshop Chronicles" by Don Daso, K4ZA; "Contest Tips, Tricks and Techniques" by Gary Sutcliffe, W9XT; "VHF-UHF Contesting" by Jon Jones, N0JK; "RTTY Contesting" by Ed Muns, W0YK; "Propagation" by Carl Luetzelschwab, K9LA; "Contesting on a Budget" by Ralph Bellas, K9ZO; "Software for Contesters" by Pete Smith, N4ZR, and "Contesting 101" by Kirk Pickering, K4RO. 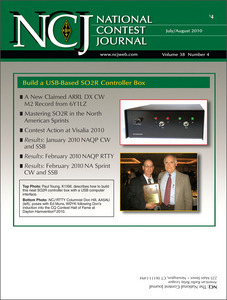 NCJ is published six times a year by the ARRL; it is edited by Al Dewey, K0AD. NCJ is what every contester needs in their shack -- subscribe today! Read more here. The July/August issue of QEX is coming soon, and it is full of theoretical and practical technical articles that you won't want to miss. 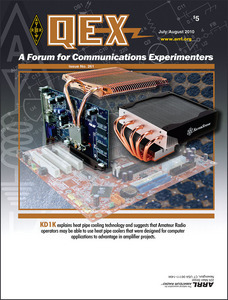 QEX is the ARRL's "Forum for Communications Experimenters." Published bimonthly, it features technical articles, columns and other items of interest to radio amateurs and communications professionals. The mission of QEX is threefold: To provide a medium for the exchange of ideas and information among Amateur Radio experimenters, to document advanced technical work in the Amateur Radio field, and to support efforts to advance the state of the Amateur Radio art. QEX is edited by Larry Wolfgang, WR1B. Subscribe to QEX today. Read more here. In April, the National Hurricane Center (NHC) debuted a new Web site dedicated to hurricane preparedness. The site explains that a lack of hurricane awareness and preparation are common threads among all major hurricane disasters, and that by knowing your vulnerability and what actions you should take, you can reduce the effects of a hurricane disaster. One of the tools that the NHC mentions on its Web site is WX4NHC, the Amateur Radio station located at NHC Headquarters in Miami, Florida. In speaking about the WX4NHC volunteer ham radio operators, the NHC notes that "formal Amateur Radio activity at the National Hurricane Center was initiated in 1980 and has been an important source of real-time weather observations before, during and after hurricane landfalls. Dedicated ham radio volunteers work at NHC during storm events to help provide NHC meteorologists with very important data that is used in the hurricane warning process. Please visit www.wx4nhc.org for a more detailed history of the WX4NHC ham radio service." WX4NHC Assistant Coordinator Julio Ripoll, WD4R, said he hopes that this updated NHC Web page "will help promote public awareness about Amateur Radio and more activity from the Amateur Radio community during this hurricane season." The 2010 AMSAT Space Symposium and Annual Meeting will be held Friday, October 8 through Sunday, October 10 at the Chicago/Elk Grove Holiday Inn located near O'Hare Airport (the same hotel that recently hosted the Central States VHF Conference, Digital Communications Conference and NIDXCC events). Amateur Radio operators interested in space communications are invited to participate in the Symposium offerings, including a space symposium with amateur satellite presentations, as well as a chance to learn about operating techniques, news and plans from the amateur satellite world. Attendees will be able to meet AMSAT board members and officers and attend the annual membership meeting, the annual banquet, the President's Club receptions and the Area Coordinators' breakfast. Room rate and reservation information will be announced shortly on the Symposium's Web site. 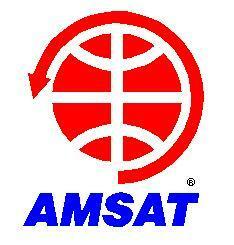 The AMSAT Symposium Committee is also inviting proposals for papers for publication in the Symposium's proceedings, as well as poster presentations and equipment and operating demonstrations. Any topic is welcome, as long as it is of interest to the amateur satellite community. Those interested in presenting must submit the tentative title of their presentation as soon as possible, with a final copy submitted by September 1, 2010 in order to be included in the printed proceedings. Abstracts and papers should be submitted via e-mail to JoAnne Maenpaa, K9JKM. For more information, please consult the Symposium Author's Guide. 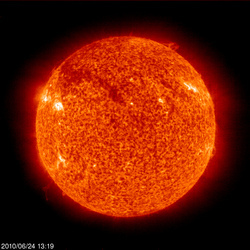 The Sun, as seen on Thursday, June 24, 2010 from NASA's SOHO Extreme Ultraviolet Imaging Telescope. This image was taken at 304 Angstrom; the bright material is at 60,000 to 80,000 Kelvin. Tad "Dreams are the bright creatures of poem and legend, who sport on Earth in the night season, and melt away in the first beam of the Sun, which lights grim care and stern reality on their daily pilgrimage through the world" Cook, K7RA, reports: Despite the fact that the previous week had two days with no sunspots, this past week had a lower average daily sunspot number, falling nearly 11 points from 26.9 to 16.1; geomagnetic conditions were quieter as well. In tomorrow's bulletin, we will have an updated propagation forecast for Field Day weekend. The latest forecast shows a slowly rising solar flux, but possibly with unsettled geomagnetic conditions. Predicted solar flux for June 24-27 -- today through Sunday -- is 74, 75, 75 and 76, with the planetary A index at 5, 8, 15 and 12. The unsettled conditions on Saturday would be from a solar wind stream spewing out a coronal hole, which may be delayed by a day or two. A two day delay would be better for Field Day operations. Look for more information on the ARRL Web site on Friday, June 25. For more information concerning radio propagation, visit the ARRL Technical Information Service Propagation page. This week's "Tad Cookism" brought to you by Charles Dickens' The Life and Adventures of Nicholas Nickleby (Chapter 13). We have received several reports from ARRL members with arrl.net e-mail accounts who have recently been contacted via e-mail asking for personal information, such as user names and passwords. Please be assured that these e-mails are fraudulent attempts at phishing and did not originate from ARRL. "This is a very crude attempt at phishing, using an easily determined spoof of the originating/return address," said ARRL Chief Financial Officer Barry Shelley, N1VXY. "There is never a time when we would ask via mass e-mail for user names and passwords of arrl.net users. There is simply no need to ever do so." If you receive an e-mail asking for personal information and it looks like it originated from ARRL, please do not respond, just delete it. This week, everyone is on the air for ARRL Field Day on June 26-27. Look for the His Majesty King of Spain Contest (SSB) and the Marconi Memorial HF Contest, also on June 26-27. The SARL Digital Contest is June 27 and the RAC Canada Day Contest is July 1. Next week, there is another running of the NCCC Sprint Ladder on July 2. The DL-DX RTTY Contest and the Venezuelan Independence Day Contest are July 3-4. The Michigan QRP July 4th CW Sprint is July 4-5. All dates, unless otherwise stated, are UTC. See the ARRL Contest Branch page, the ARRL Contest Update and the WA7BNM Contest Calendar for more info. Looking for a Special Event station? Be sure to check out the ARRL Special Event Station Web page. The new WINMOR component of RMS Express allows users to access the Winlink 2000 network on HF with virtually no external hardware -- just a transceiver and a sound-card-equipped computer. The Amateur Radio Safety Foundation (ARSFI) has announced the availability of RMS Express user software with WINMOR, a new radio-email application for use with the Winlink 2000 network. The WINMOR protocol was introduced at the 2008 ARRL/TAPR Digital Communications Conference in Chicago. The goal of the WINMOR development effort was to create a soundcard digital mode that would provide an alternative to PACTOR for accessing the Winlink 2000 network. After two years of beta testing, WINMOR TNC, a software-based "helper application," is now available as part of the new Winlink RMS Express user software suite. Read more here. Registration remains open through Sunday, July 25, 2010, for these online course sessions beginning on Friday, August 6, 2010: Amateur Radio Emergency Communications Level 1. To learn more, visit the CEP Course Listing page or contact the Continuing Education Program Coordinator.